Flavored teas are a blend of a base tea – black, green, oolong or white together with herbs, fruits and flavoring. Some teas are just a base tea with a flavoring, like our Black Cherry. In addition enhancements are added to improve the visual appearance and entice you to buy, but do not really change the flavor. White & green tea (blend of 7 different types), jasmine, mango bits, pineapple bits, papaya bits, orange peels, strawberry bits, red currants, sour cherry bits, apricot bits and natural flavoring. Earl Grey is a tea that originates in England and consists of a base tea, normally black, and an oil type flavor of bergamot (a citrus fruit) with a very characteristic strong aroma. Many blends rely on the flavoring to sell the product but use an inferior base tea giving an infusion that lacks total flavor and is bitter. I believe we have one of the best Earl Greys as it has a natural organic flavoring on a high graded organic Chinese black tea. Pu Erh is a famous fermented (aged) blackish Oolong that many tea books list as a medicinal tea. The earthy vegetative aroma and taste put off many people from trying. With the addition of fairly strong herbs & flavoring it can be changed to a very drinkable tea and I refer to it as the morning after tea. If you have had some bad food or over indulged it really helps your stomach recover and we always take my favorite, Mint Vanilla, when travelling. It is so effective that many chemotherapy patients find it helps reduce sickness. We also offer a ginger version as well as a strawberry/mango (French Kiss). SO when you consider buying a flavored tea, look at the ingredients to see if the blender has tried to come up with a really special assortment that may give you a new favorite tea. English Tealeaves has been in business since 2002 and has grown to offering 125 choices, but still gives outstanding customer service with a personal touch. We make it easy for you to contact us by email or phone with questions on tea or shipments. Almond Rose - an unusual blend of black tea, spices, nuts, rosebuds and vanilla flavoring that gives a complex floral spicy cream flavor. 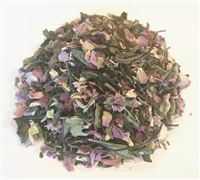 Blossoms - a blend of three black teas from India, Ceylon and China blended with several blossoms and petals to give a very floral aroma and taste. 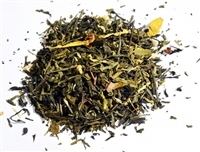 Chai White - white tea base with great spices to become a very tasty chai that is smooth and gentle on your stomach. 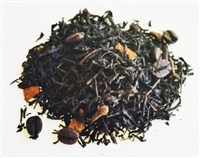 Earl Grey Royalty* - organic black tea from China & Darjeeling, India resulting in a milder British style blend. Moroccan Mint* - tastes just like fresh mint leaves from your garden with a green tea.